Since living in Crete I have discovered what a wonderful invention the computer is for keeping in touch not only with relatives and friends,but the rest of the world. Anything you need to know about, is there at the touch of a button.It was through this media that my friend Joy Valero who lives in the United States contacted me by e mail regarding a subject we both share,that of the Native American Indians. 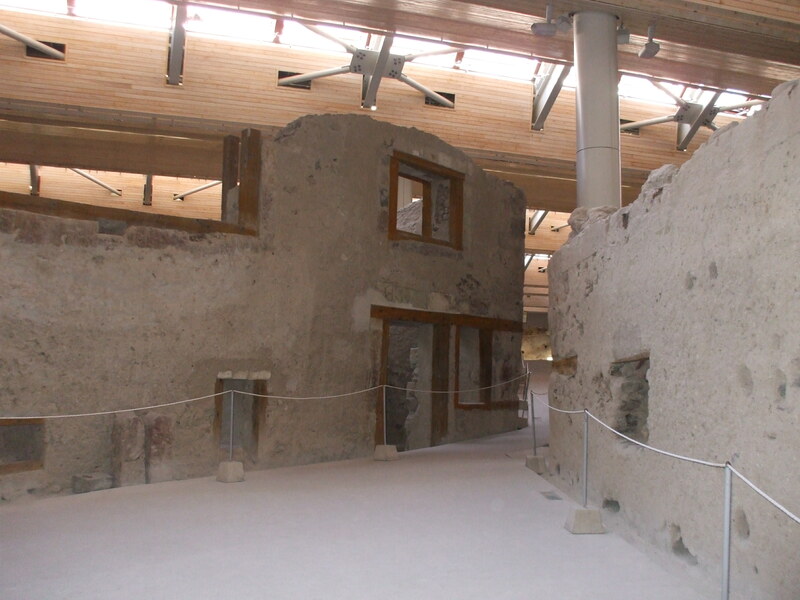 However, it is the archaeological site of Akrotiri that my post is about today and I hope you will enjoy it. You can imagine how delighted I was when my friend decided to come to visit us and we met in person for the first time in four years. Joy was staying with us for two weeks so my partner John and I had a few places in mind we wanted her to see even though she had her own itinery which included Akrotiri on the island of Santorini in Crete. 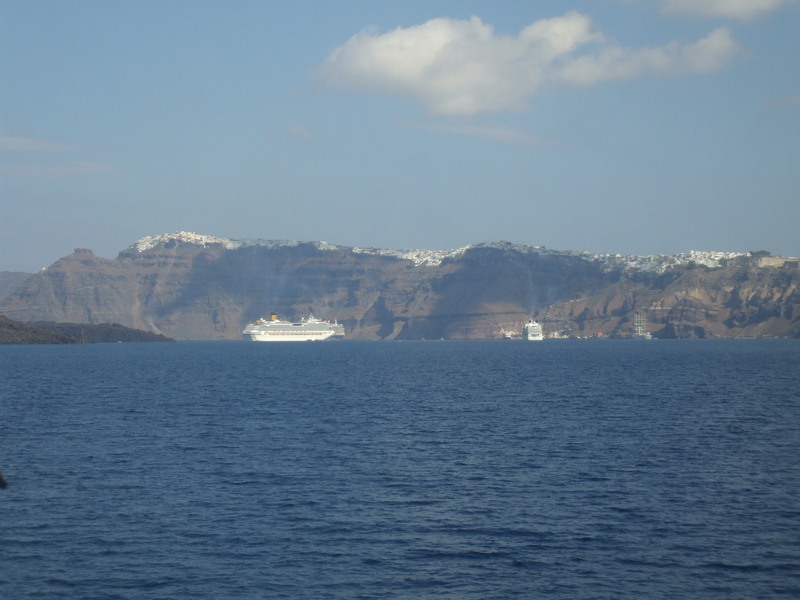 The approach to Akrotiri is a wonderful sight to behold .Click the picture above for larger view. Akrotiri is identified as the best preserved prehistoric site and is therefor regarded as a crucial site because of that.At the end of the 17th century B.C., the volcanic Thera erupted,in what seems to be one of the biggest eruptions in the history of our planet. 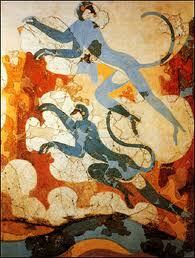 Under the volcanic remains,lay the city of Akrotiri. It is believed that the 30,000 inhabitants flew before the disaster occurred as no bodies were recovered. What was recovered however was extremely well preserved. 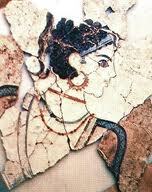 Artifacts such as pottery and beautiful wall paintings were found. The volcanic eruption had been a disaster but at the same time a preserver. 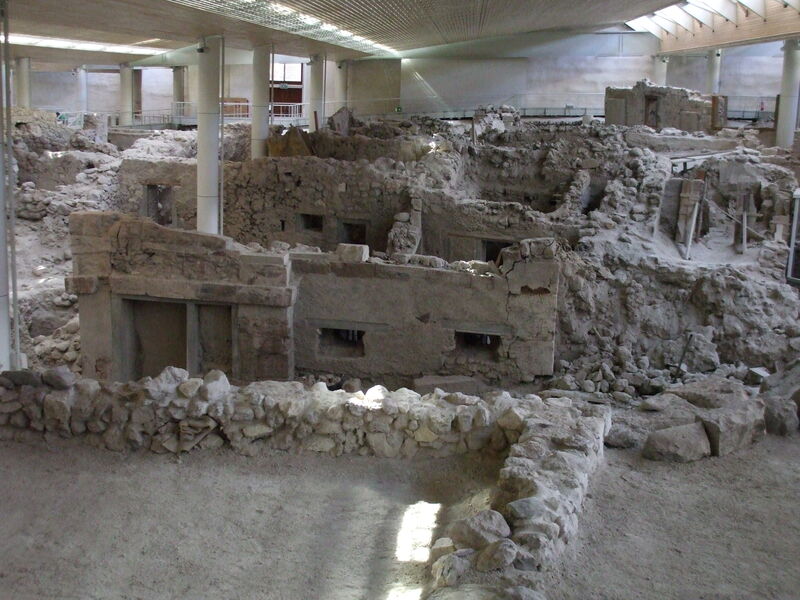 When my friend and I arrived on Akrotiri we were absolutely stunned by the size of the archaeological site, we could not believe so much of the city had been discovered under all the debris from the Thera eruption. We were looking at most of the houses and other buildings almost complete except for their roofs, it was amazing. The site was first discovered in 1866,after another small volcanic eruption,and since 1967 excavations began then under Professor Spyridon Marinatos. Streets, public and private three floor high buildings and squares can be seen. 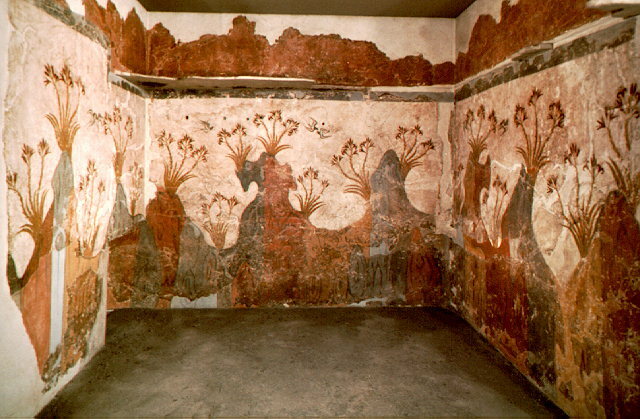 In every house astonishingly well preserved wall paintings covering the interior of these buildings were found Wall paintings were found in public as well as private houses. 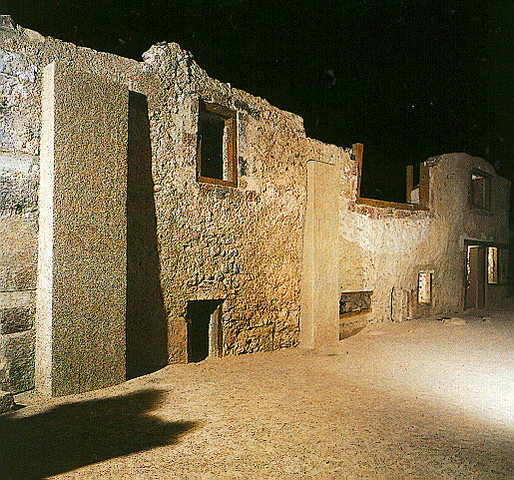 Each home had its own drawings, which shows it is very likely that the subject painted was related to the people living in these houses at the time. 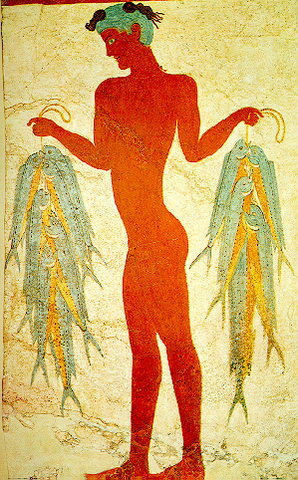 For instance,a fisherman would have paintings related to his occupation and so on. 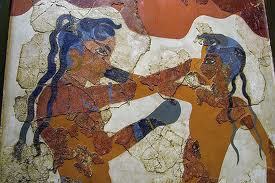 Much information concerning the lives and habits of the people can be drawn from the wall paintings alone. Most human figures represented are well dressed,with jewelry. Animal paintings were also evident. 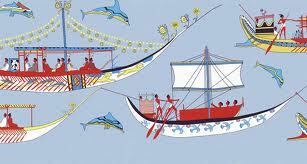 The Minoans impressionable Naval fleet was also depicted in many murals. by leaping dolphins,while ladies shade beneath the light canopies. 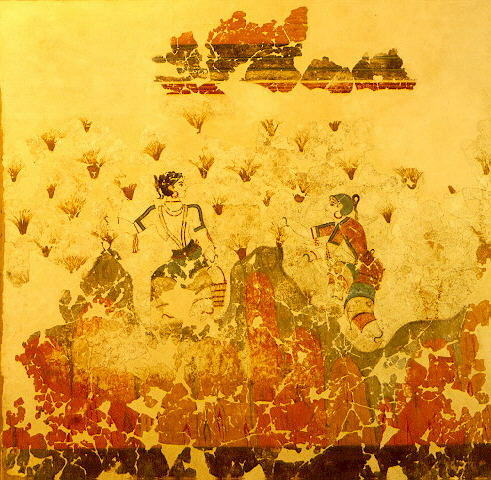 Here are a few more of these beautiful frescoes found in various rooms at the Akrotiri site. 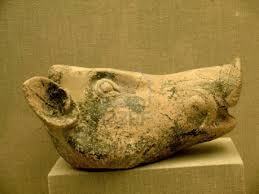 Table of offerings Akrotiri Pottery Boars Head. In the all important well organised West House, there were storerooms,workshops, a kitchen and a mill installation was discovered. The first floor was occupied by a spacious chamber which was used for weaving activities. A room for the storage mainly of clay vessels was also uncovered. This room is where the fresco of the fishermen and the famous Flotilla freize was found. 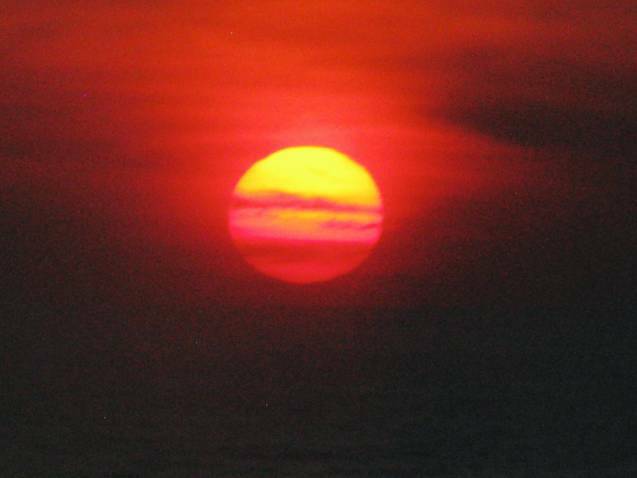 This photo was taken of the spectacular sunset over Santorini on our way home. Obviously there is much more to this archaeological site than I can put here but I hope it will give some idea of the many hours, or should I say years put in by the team of archaeologists and conservationists enabling us to see the importance of Akrotiri. I myself, and my dear friend Joy were awe inspired and completely exhausted when we left Akrotiri,but what a day to remember. The Town of Worcestershire in England is one of my favourite places, not only because of its history but because I spent many years working alongside archaeologists and specialists in their own field, such as those working on flint,old coins, bones, metalwork ,jewelry, fabrics,stone tools,pottery and many more items which are found on archaeological sites, helping us to reconstruct our past. The history of Worcester goes back as far as Paleolithic times where 125,000 years ago hippo’s lions and elephants would have been a common site in the county. Early settlers used tools made of flint and other stone. Most of the Paleolithic tools from Worcestershire have been found in quarries along the terraces of the River Avon. These include handaxes and others made from flint and stone,the remains of animals and plants from the time have also been found. The Mesolithic period (Middle Stone Age) people lived in a landscape of heavily wooded river valleys,they made full use of the natural resources including the slightly more open area’s on higher ground. Mesolithic people made and used smaller flint tools called microliths,maybe for the purpose of hunting.The Kidderminster area is the richest in the county for such finds.A few of these tools have been found in quarries such as at Beckford and Kennerton. It is worth mentioning that The Worcestershire Young Archaeologist Club discovered some of these tools Nr Broadway an area where stone,sand and gravel are quarried. THE NEOLITHIC PERIOD 4,000 BC lifestyles change and communities began to domesticate animals such as pigs,sheep and cows for meat,wool and milk. Using fire and axes they created small clearings in the woodland to grow their crops such as cereals and beans and to provide grazing for their animals. Pottery was used for the first time. 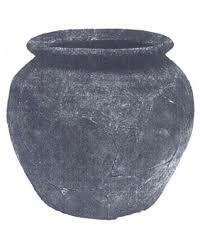 This is where my interest in ancient pottery began………..No I was not there in Neolithic times………….. I will come to that in more detail later. However they did not live in permanent homes or villages but lived a partially nomadic lifestyle,still hunting and gathering wild food which remained an importent part of their diet. 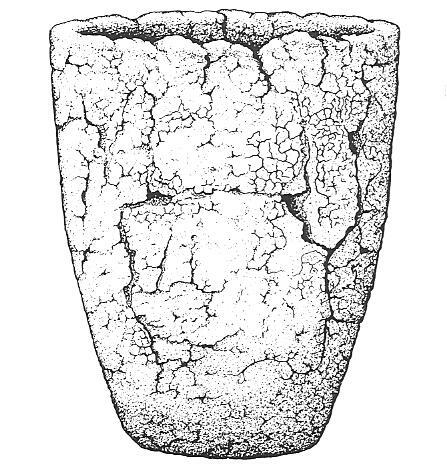 IN THE BRONZE AGE many Barrows (burial mounds) once dotted the Worcestershire Countryside but thousands of years of ploughing have flattened these mounds, leaving only the surrounding ditch and occasionally a central burial for archaeologists to find, and usually a large pottery collared urn containing the cremated remains. IN THE MIDDLE BRONZE AGE people lived in permanent settlements where their homes were mostly clusters of thatched roundhouses. Droveways and waterholes enabled careful control of grazing land for sheep and cattle.Pigs foraged in the surviving woodland. 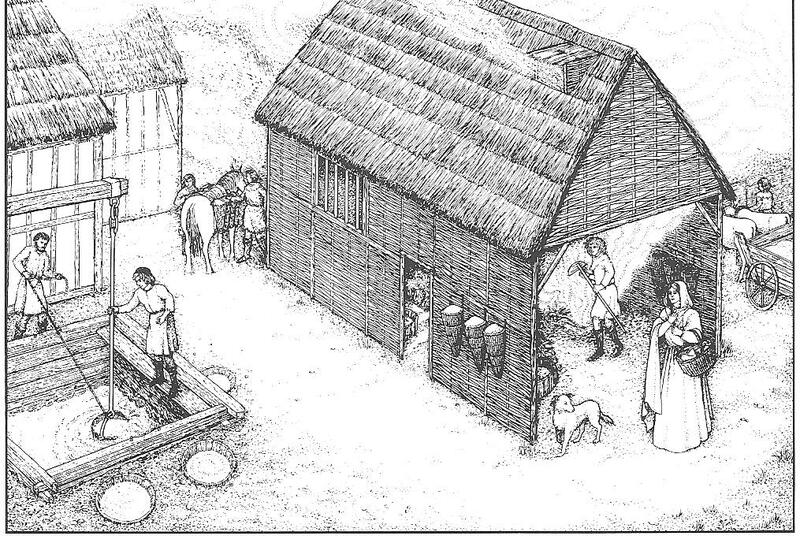 DURING THE IRON AGE AND EARLY ROMAN periods the countryside was dotted with several farmsteads surrounded by vegetable plots,animal pens,fields and meadows. Throughout the Iron Age and well into Roman times most people would have lived in thatched roundhouses,although during the Roman period people did begin to build square or rectangular houses,some with tiled roofs, with a ditch and hedge or fence forming an enclosure within which the house would have stood. Other buildings like workshops and barns would also have been within the enclosure. Occasionally several farms were built clustered together to form a small hamlet or village. Postholes,pits ,walls,yard surfaces,hearths,ovens and ditches which define farmsteads and many other features provide a wealth of evidence for archaeologists to discover about how ordinary people lived at this time. 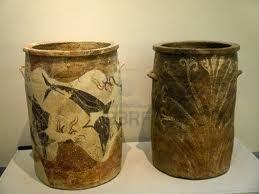 In contrast with earlier periods archaeological finds of Iron Age and Roman date are quite common. This is partly because the population of Britain was greater than it had been before,also because the sites tend to be larger and have bigger features(such as ditches) in which many artifacts are often recovered. 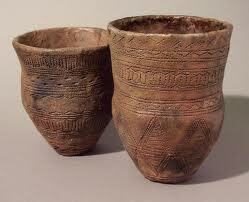 By the late Iron Age pottery and other goods were being more widely made,traded and used. In the Roman period many goods were produced on an industrial scale. 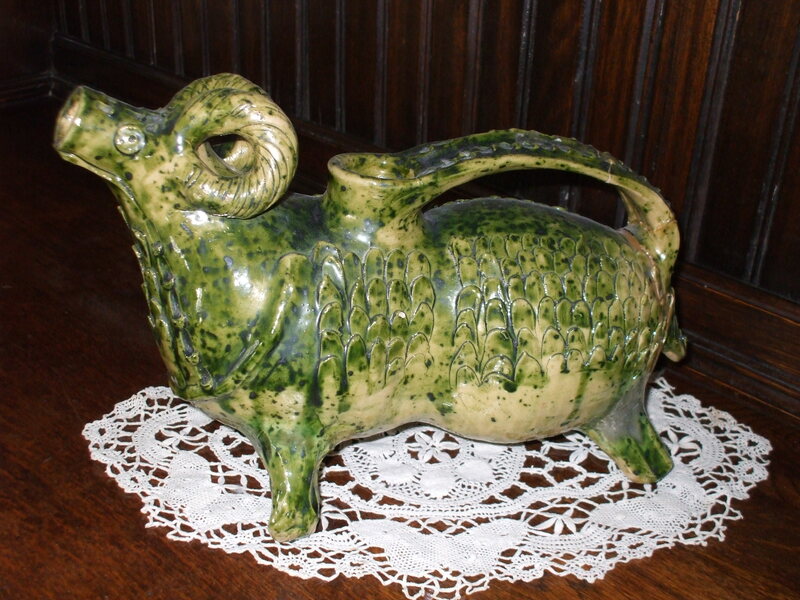 Locally,the main products were salt,iron and pottery and these were widely traded across the region. The most commonly found sites belong to the Iron Age and Roman periods so it comes as no surprise that archaeologial investigations in quarries have discovered many farmsteads and settlements dating from these times. These quarries include a nationally important series of Iron Age and Roman enclosures such as,Beckford in south Worcestershire, Aston Mill quarry Kemerton, Ball Mill quarry Grimley, Clifton quarry Severn Stoke, Holt Castle quarry and Larford quarry. These enclosures were excavated during the 1960s and 1970s. In total, eleven large settlement area’s were investigated along with seven smaller domestic enclosures and eleven other small enclosures. 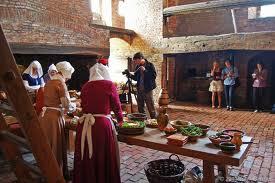 A total of twenty five roundhouses and over eight hundred pits were recorded along with yards and ovens. A small cemetery contained burials of Iron Age and Roman remains. Handaxes and stone tools have been found at most of these sites inclusive of Mesalithic flints,ring ditches and the ploughed out remains of barrows(burial mounds). 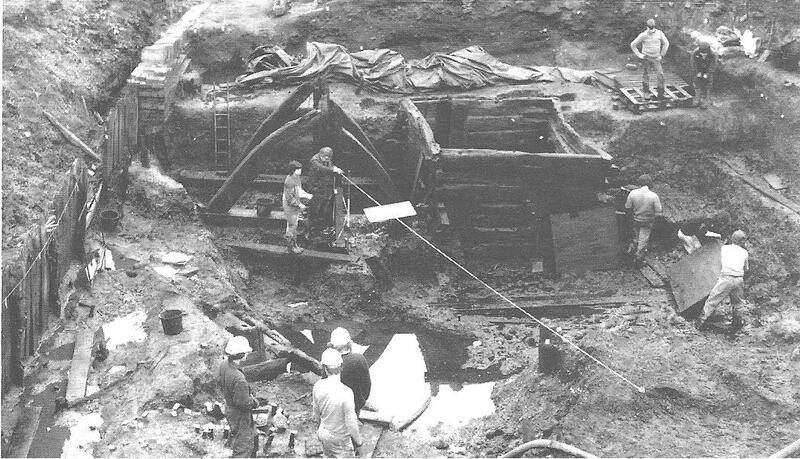 In the 1970s and 1980s Work was undertaken by the Archaeology Section of Hereford and Worcester County Council.Excavations revealed extensive remains of early Droitwich and disclosed much about the development of the salt making industry.In many cases the remains were in exceptionally good condition because of waterlogging which helps the preservation process. Writing about Droitwich brings back many happy memories working on this site with many of my archaeological friends. So many years ago. Salt being a basic commodity was in demand and until the 1920s Droitwich was an important source. Here the industry has probably been in continuous production from the beginning of the Iron Age,this we shall see when writing about the excavated finds and Droitwich’s involvement in the regional economy through the salt trade. 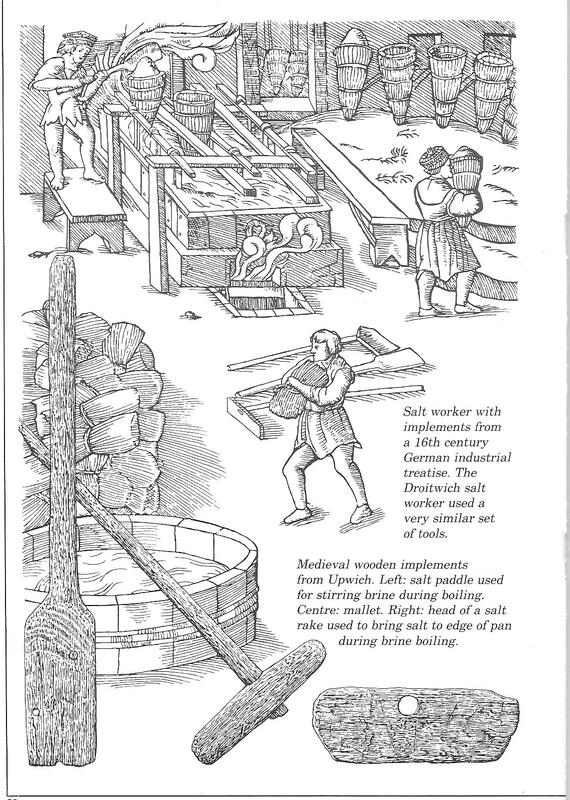 Reconstruction Iron Age Salt Making. The composition of Droitwich brine is a particularly pure source of sodium chloride(commonly known as salt) as it contains few other ‘salts’ compared with brine from anywhere else,and so requires relatively little processing to make edible salt. Much of the brine is very concentrated.4.5litres (1 gallon) of brine producing about 1.32 kilograms(2.9 1bs) of salt making it very economical to use for salt making. 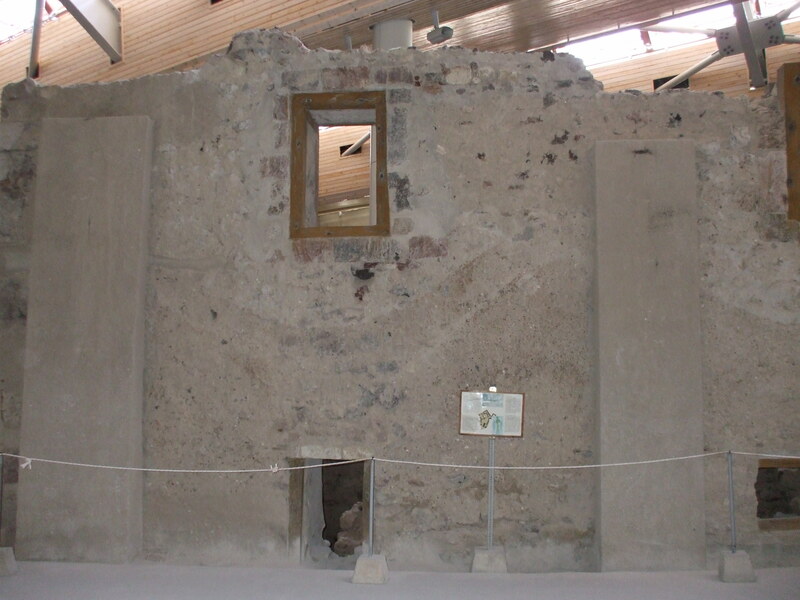 Salt making began by extracting brine from the springs.This was made easier if the brine had already been collected in a well.However,in the earlier period it may simply have been collected from a hole over the springs.Once collected the brine could be cleared of dirt by allowing it to settle. Salt was produced by evaporating the brine.Natural evaporation would lead to salt being produced,but in the British climate this is unlikely to have been of much practical use for large scale production. A typical method usually referred to as the’ open pan’ method- was to place the brine in a container and heat it to boiling point.Wet salt crystals deposited from the solution were then removed and placed in another container which allowed the salt to drain,forming a solid block. The best preserved salt manufacturing areas of Iron Age date are located to the south of the river Salwarpe in the vicinity of friar street. Here from about the 3rd-2nd century BC a well organised salt production centre operated. The basic salt making equipment consisted of large clay-lined brine tanks,hearths for boiling brine,and briquetage vessels.These vessels,though apparently crude,were specifically designed to dry the salt and were also used for its transportation.Very large quantaties of’ ” briquetage” have been excavated in dense layers in the salt making areas of Droitwich. The remains of these clay salt containers have also been found on many Iron Age settlements in Hereford and Worcester,and beyond. A network of salt trade and exchange across a large area can therefor,be mapped in detail and gives us an impression of the considerable economic importance of Droitwich salt,even in this early period. Briquetage Pot for the storage and transportation of salt. In the West Midlands little archaeological evidence has been recognised for the Saxon period. However excavations have revealed that important remains of this date survive in Droitwich.These show that against the national background of economic recession and warfare, Droitwich continued to be a major producer of salt. 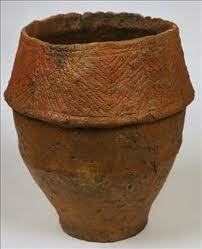 This decorated Saxon pot was most likely used for burial. 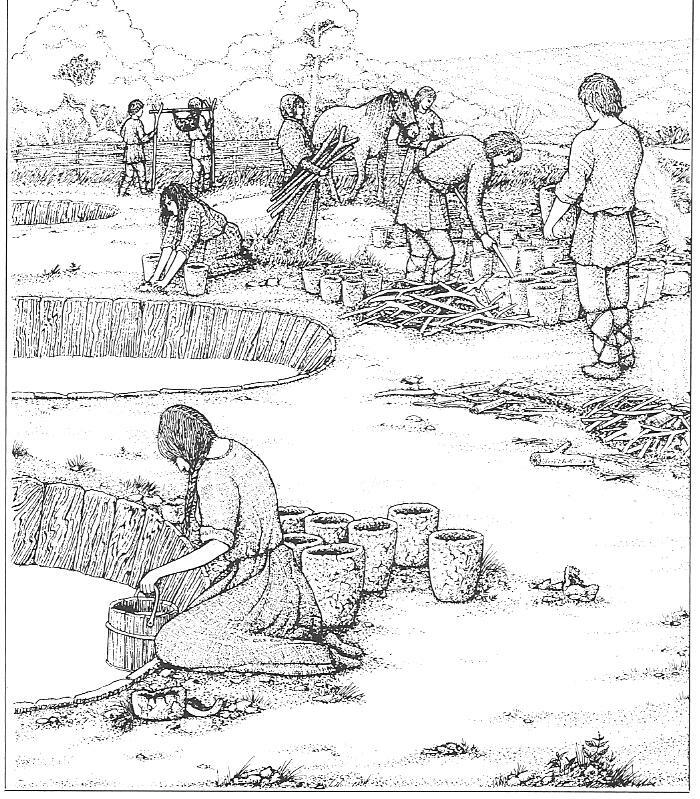 This period of salt making activity dated from about 5th to early 7th century.The use of lead pans and the size of the hearth,indicated that salt was not being manufactured for local consumption. The discovery of pottery much of which was not made locally,also confirmed a strong impression of trade and contact with other regions. Three areas of Droitwich- namely Upwich, Middlewich and Netherwich were all involved in the medieval salt industry,Upwich being by far the most imporant. During the mid 13th century,this brine well failed on several occasions. An appeal was made to Richard de wych Bishop of Chichester who was born in Droitwich,for help By 1264 the Upwich brine well had deteriorated again whereby the County Sheriff reported to King Henry lll that the brine well would have to be rebuilt..
Archaeological excavations in 1983-84 revealed the Upwich brine well site and clearly showed where the rebuilding had taken place. Some of the salt making houses (known as seals) were first dismantled and a deep hole was dug out within which the new well was built. Working directly over the brine springs the medieval construction workers must have found conditions very difficult. 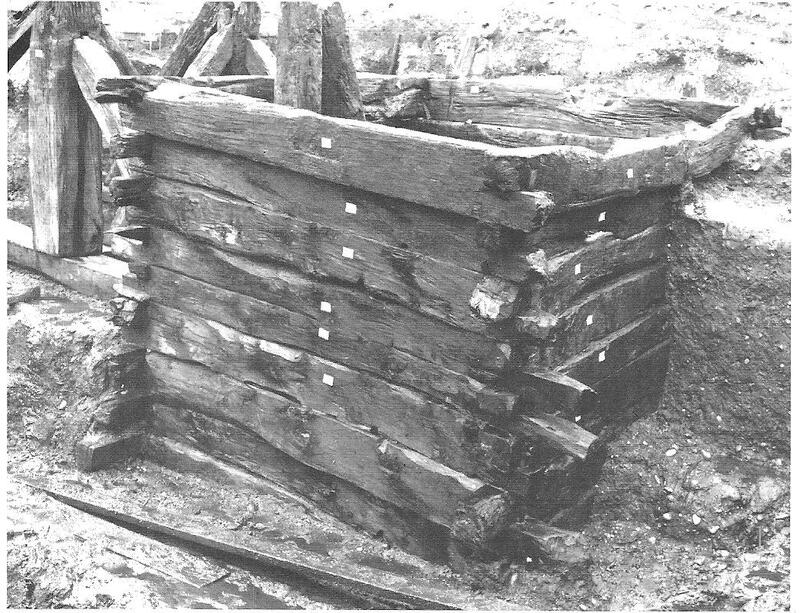 The new well was a timber structure 10 feet square by 30 feet deep and made from large beams overlapped at the corners, gaps were packed with moss. A ladder was attached to the inside for inspection and cleaning.Extraction of brine was by a large bucket attached to a winch or crane known as the’ rydhoc’). Wear on the timbers around the top of the well and the position of the platform,show that the bucket was guided with ropes. Once lifted,the brine could be poured for temporary storage into barrels beside the well. A general view of the Upwich excavations 1983-4. While excavations were being carried out at the Droitwich Salt Works one of my jobs was the sorting of many pottery shards found on the site. I had been through the preliminary stages of pot washing which would seem quite boring to some ,but this helped to learn about the different fabrics and forms once they had been washed clean. The Hereford and Worcester County Council had provided us with adequate storage space with room to work on all finds. I began by setting out as much pottery there was room for on the tables provided. Archaeologists John Price and Derek Hurst were there to help if there was any of the pot shards I did not recognise and it was not long before I knew the difference between the Iron Age ,Roman, Saxon and Medieval pottery, I was then left to use my own system of sorting, which was, Rim shards first,then the body shards followed by the base shards. Feet from cooking pots and handles from amphoras set to one side. This way makes it easier to spot any pieces that join together. The next proceedure was having to recognise where these pot shards had originally travelled from. i.e. The Malvern hills is not so far away,so some of the shards which had Malvernian rock inclusions was classed as ‘ Malvernian’ pottery and so on. The Roman Samian ware pottery was produced mainly in south and central Gaul in the first to third centuries A.D. and imported into Britain. It was easy to identify this because of its red colour,glossy surface and decoration by means of moulds.English potters began to copy this pottery. 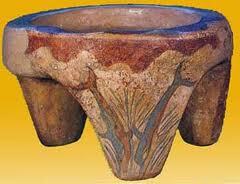 There were many different periods of pottery to learn about and I wanted to learn about them all. After twelve years I managed to achieve my goal. 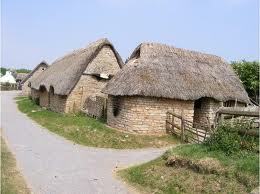 Cosmeston medieval village was originally discovered in 1977 by the Gwent and Glamorgan Archeaology Trust. It is an example of the type of settlement planted by the Normans from the late llth century as they strengthened their foothold on South Wales. The excavation was carried out this year and run as a partnership between Cardiff University and the Vale of Glamorgan Council. The site has revealed evidence of a flourishing pottery industry namely, ‘Vale Ware’ and is mostly utilitarian type. The potters also produced greenglazed Aquamaniles, these vessels were used by guests attending manorial high table for washing their hands. Several fragments of 13th century greenglazed aquamanile were discovered at the Cosmeston Manor house,one being decorated with a rams head.The Aquamanile fragments were mostly scattered in post medieval demolition layers,along with glazed ridge tiles. Thousands of pieces of the local ‘Vale Ware’ have been found on the site but the aquamanile is of special interest.’Vale Ware’ points to the regions growing self sufficiency in the medieval period,as pottery imported from England began to be replaced by locally produced items. Once thin sectioning on the pottery is carried out,it is hoped that it will reveal the mineral composition of ‘Vale Ware’ pottery to local clays,thus enabling the centre of production to be pinned down in due course. My repro Aquamanile.Purchased at Cosmeston Medieval Fair. At the Medieval Fair Cosmeston. 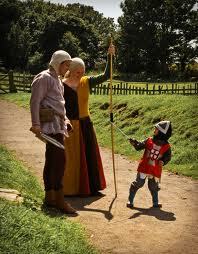 Children also enjoy the Cosmeston Medieval Fair.